Get notified when Fun Fun Fun Fest tickets are available! Fun Fun Fun Fest (F3F) is a festival that celebrates two distinct art forms – comedy and music. 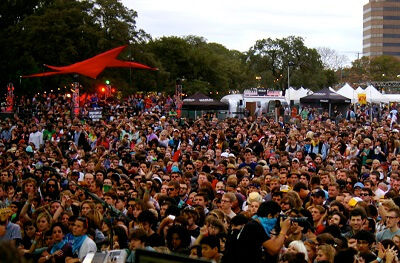 The festival is held every year in Austin, Texas and is the only festival to distinguish genres and base the festival off of them. There are stages in F3F that are specific to certain genres of music including electronica, hip-hop, indie rock, heavy metal and punk, and then there are stages that are dedicated to comedy. This festival has been going on since 2006 and it highlights some of the most talented up-and-comers in the music and comedy professions and anyone who is a fan of either one should attend in person and see what the future of music and comedy looks like, so if that describes you, be sure to get your Fun Fun Fun Fest tickets today using the links above!